The Netherlands celebrated the bicentennial of their existence as a kingdom in 2013. But at the time that was actually 198 years ago, not 200. From 1813 to 1815 the Netherlands were the Souverijne Vorstendom der Verëenigde Nederlanden (the sovereign principality of the united Netherlands). We didn’t have a king, but a prince. Without a king, the Netherlands could hardly have been called a kingdom at the time. So this year, 2015, we can celebrate again! On 16 March 1815 sovereign prince Willem proclaimed himself king Willem (I). During the same year, the Southern Netherlands were also incorporated into what is then officially called The United Kingdom of the Netherlands. The constitution and the division of the Staten-Generaal (States General) into what we now call the Eerste Kamer (‘First Chambre’, comparable to the Senate or the House of Lords) and Tweede Kamer (‘Second Chambre’, comparable to the House of Representatives or House of Commons) also date from 1815. However, fifteen years later the United Kingdom of the Netherlands would fall apart: the Southern Netherlands became the independent Kingdom of Belgium. 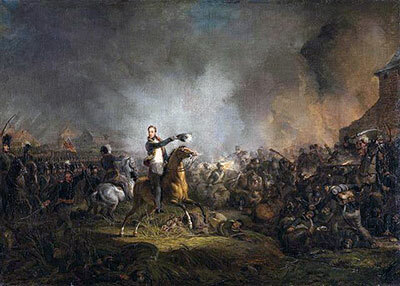 On the upper left is a painting of Prince William of Orange (the eldest son of the newly-made King Willem I and later Willem II) during the Battle of Quatre-Bras (15 June 1815), made by Jan Willem Pieneman in 1817. The battle between the allied forces of the United Kingdom, the Netherlands, and the German principalities Prussia, Hannover, Nassau and Brunswick and the French army under Napoleon was barely won by the allied forces.. Two days later the decisive Battle of Waterloo took place. Napoleon Buonaparte was defeated at last. The picture from 1870 on the right shows a Ball in Brussels on the eve of the Battle of Quatre-Bras. It was hosted by the Duchess of Richmond, and among the guests were the Prince of Orange and his brother Frederik. A ball was not just a dance party. People talked, ate and drank. Food was also served at the balls of King Willem I, father of the Prince of Orange and Frederik. Some of these menus have been preserved. 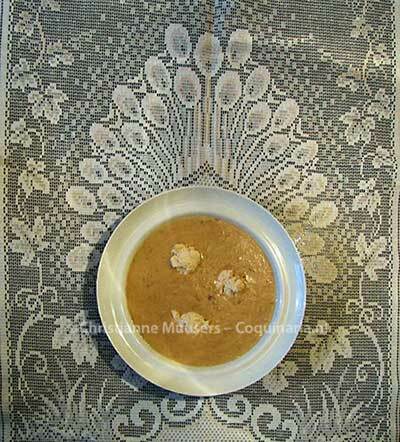 Meals at balls often started with nourishing soups, amongst which something like the Terrine met puré van Garst lieerd (thick soup of pureed barley), of which the recipe is listed below. The ball menus of Willem I mention dishes, but they do not contain any recipes. To investigate what kind of soup could have been served, I have chosen two different barley soups from the beginning of the nineteenth century. The recipe on this page was written by the famous French cook Antonin Carême. Despite the French occupation of the Batavian Republic, as the Netherlands were called from 1795 until 1806, the French cuisine was still popular. Here is a simpler barley soup from the Dutch cookery book Aaltje. And on the life and works of Carême you can read more on the page for his recipe for soufflé. Carême describes the menu and organization of a large ball for six thousand people in his Maître d’hôtel français in 1822. 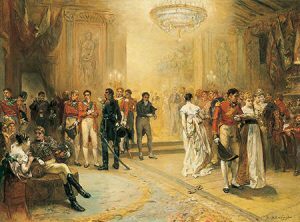 The ball itsel took place on 21 February 1816 and was hosted by the National Guards of Parisfor the Royal Guards. These were called the Imperial Guard until Napoleon’s downfall. Six different soups were served in a total of 1500 soup-tureens. No barley soup was served this time, but consommé with rice, with vermicelli and with semolina. These are all nourishing soups, thickened with some sort of grain. Other soups that were served at this ball were potage à la Condé (with pureed beans), chicken soup and brunoise(vegetable soup). The complete menu can be found in the Maître d’Hotel. Carême also describes the enormous buffet which was open for the guests from eleven p.m. onward. 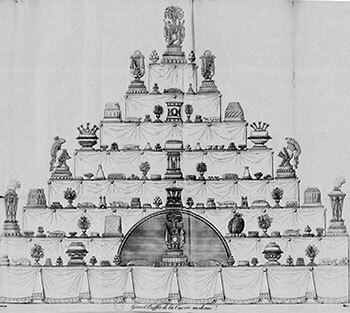 It had nine tiers (see illustration on the right). “Il produisit un effet aussi élégant que somptueux, et nos travaux de cuisine brillèrent d’un nouvel éclat”. ([this arrangement] had an effect that was elegant as well as sumptuous, and our kitchen produce shimmered with a new lustre). In the rooms around the buffet were long tables with seats for whoever felt the need for some nourishment during the ball. But this turned into chaos, because ladies in the many private loges did not want to show themselves near the buffet. Their gallant companions hastened to and fro to serve them with food and drink, which caused a shortage of dinnerware in the public rooms near the buffet. “Mais qu’importe si les deux tiers des personnes invitées ont soupé en petit comité, et que l’autre tiers ait éprouvé quelque retard pour se faire servir quelques fragments du buffet? L’essentiel de ces grandes réunions doit être la satisfaction de toutes les personnes invitées”, writes Carême: With six thousand guests these things are inevitable. Most balls were on a smaller scale with ‘no more than’ one or twothousand guests. Carême’s Le maître d’hotel français was published in 1822. He already had a very impressive list of employers. This book is not a cookery book, but neither is the maître d’hotel a cook. In those days he was the supervisor of everything concerning supplies, cooking and organizing meals in a large household. He was the cook’s superior. Carême’s book contains menus in the manner of the cuisine ancienne of Louis XV between 1745 and 1751, and in the manner of the cuisine moderne for all year round in the year 1822. Note that all catholic fish days appear to have been abolished. Lent is all that is left and even that was shortened. In the book Lent is from 1 March to 7 April, but Ash Wednesday – the start of Lent – was already on 20 February in 1822. This list of menus is followed by menus served in the period up to 1818, as was the ball described above. Finally Carême presents menus he served to his most prestigious employers, like Czar Alexander in Paris and Chalons-sur-Marne, the English Prince-Regent in Brighton and the English ambassador in Vienna. Barley is so old-fashioned that no doubt it will be the next ‘new’ superfood, if it isn’t already. Before the potato became a staple in North-West Europe, barley provided an important part of our daily intake of carbohydrates. Look for example at this recipe for kale with pearl barley. When the potato was finally accepted as staple food, barley disappeared from the table as an accompaniment to meat dishes. Even porridge for breakfast (with groats from barley, oats or buckwheat) is hardly eaten anymore. That is a pity, because especially during cold winter mornings warm porridge is more comforting than cold milk or yoghurt with muesli or cornflakes. 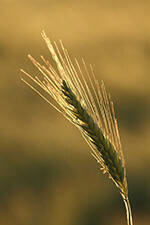 Barley is also an important ingredient for beer and whisky. Pure barley bread will be hard to find as the grain does not contain enough gluten. A nineteenth-century recipe for Dutch barley soup can be found here. By the way, in Italy barley groats are called orzo perlato or orzo. These are expensive and very white (bleached?). But if you buy groats in a Polish or Russian food store it will cost you a third of the price for Italian groats. Just try it. 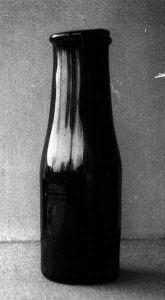 The recipe for barley soup is from L’art de la cuisine française au XIXe siècle. Traité élémentaire et pratique, (see bibliography). In the edition of Librairie Payot the recipe for rice soup is on p.71, and barley soup is on p.73. The author needs many words for his descriptions, but I have abbreviated the recipe in some places (where you see […]). 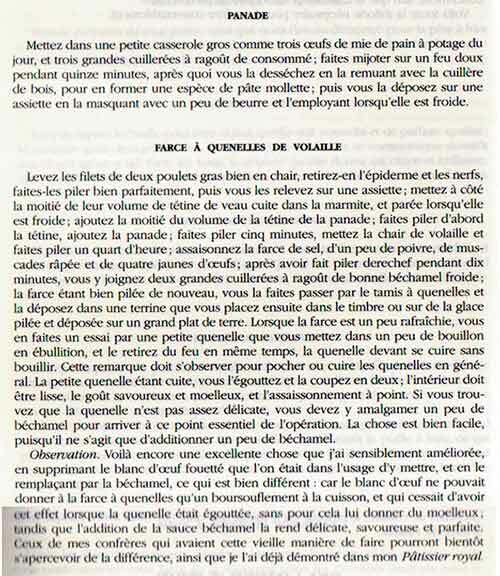 The ‘quenelles de volaille’ can be found on pp.50/51. This is also a very extensive recipe, of which I present a summary. Whoever wants to read the complete recipe (in French), can follow this link. The genesis of L’art culinaire française is complicated. The work consists of five, seven or eight parts, depending on one’s definition of a ‘part’. The first three (or five or six) parts were written by Carême. The last two parts were published ten years after his death. These were written/revised by his friend and former collegue Armand Plumerey. L’art culinaire français au xixe siècle has never been published as one series. Even today one has to shop around to acquire all parts. Unfortunately the last two parts by Plumerey are only available as (poor) facsimiles. C’est la même manière de procéder que celle indiquée au potage de riz a la française; seulement vous préparez dix onces d’orge perlé avec d’excellent consommé, et le faites mijoter pendant cinq heures, afin qu’il soit savoureux et moelleux au palais; puis vous ajoutez de petites quenelles de volaille préparées et formées de la manière accoutumée. It is the same manner of preparing as the one described in rice pottage à la française, but you use ten ounces of pearl barley with excellent consommé, and let it simmer for five hours until it is tasty and creamy to the palate. Then you add small quenelles of poultry, prepared and formed in the usual manner. [prepare stock with chicken, veal , chervil and root vegetables, degrease and strain through a cloth] ensuite vous en versez la moitié dans une casserole contenant six onces de riz […], puis le quart de la mie d’un pain à potage de huit onces coupé en dés. Faites mijoter pendant deux heures […], faites-le passer en purée par l’étamine; ajoutez à cette crème de riz le reste du consommé; faites bouillir, et au moment de servir, vous y mêlez un verre de bonne crème double et deux pains de beurre frais; ensuite vous versez le potage dans la soupière contenant de petites quenelles de volailles formées dans des cuillères à café. Ce potage est velouté et convient aux dames. Prepare stock with chicken, veal , chervil and root vegetables, degrease and strain through a cloth. Then pour half [of the stock] in a pan with six ounces of rice[…], and a quart crustless soup bread cut in dice. Simmer for two hours […], purée it by straining; add the remainder of the consommé to this rice-cream; bring to the boil and at the moment of serving add a glass of good double cream and two ‘breads’ of unsalted butter. Then pour the soup into a turreen with small poultry quenelles that have been shaped with cofee spoons. This soup is soft as velvet and befitting for ladies. Panade – [prepare stock with chicken, veal, chervil and root vegetables, degrease and strain throug a cloth] Make a panade with bread crumbs, consommé, butter. Quenelles – Pound the breast fillet of two fat chickens. Pound half as much boiled cow udder (?, tétine de veau) with half the panade. Temper with salt, pepper and nutmeg, add two ragout spoons cold béchamel sauce. Pound again and rub through a sieve. Keep on ice. Make quenelles and poach them (do not boil the water). Carême adds that he replaced the beaten egg whites that are commonly used in quenelles by béchamel sauce, resulting in a better structure and taste. For the quenelles I have used a much simpler recipe (and I used egg whites!). If you want to prepare the original quenelles of Carême you can consult the scanned pages (here). First course for 6 to 8 persons; preparation in advance 20 minutes + making the dough for the quenelles; preparation 1 hour. Pureed barley groats – Put the groats in a pan with water and salt. Bring to the boil, cook for one minute. Strain and rinse. Add these groats with bread to the stock, bring to a simmer and leave it on the fire for two to three hours. Then puree this soup in a blender or by using a hand blender. You can als push it through a sieve. Quenelles – Prepare the dough as choux pastry: bring the milk to a boil with salt and butter. Add all the flour and work it with a wooden spoon into a firm dough. Let it cool slightly, then add the yolks one by one. Put the dough in the refrigerator as soon as it has cooled enough. Leave it for an hour. Meanwhile, put the chicken meat in a blender and purée it. Add the egg whites and pepper, blend it and then work this chicken purée into the dough until it has a homogenous structure. Keep the temperature as low as possible. Put it back in the refrigerator for at least an hour. Beat the cream. Put the dough for the quenelles in a bowl on ice, and work the cream into it. Return it to the refrigerator for a whole night. Heat the soup on a small fire, take care it doesn’t burn. Meanwhile, shape the quenelles with two teaspoons, and poach them in salted water that is kept just below boiling. As soon as the quenelles start floating, they are done. This will probably take about a minute. Stir butter and cream into the soup just before serving. Carême first puts the quenelles into the turreen and then pours the soup over them. To me it seems easier to keep the quenelles separate and add them in the individual soup plates or bowls. Follow the recipe above, but use vegetable stock as basis and prepare the quenelles with chervil and cheese instead of chicken. Marie-Antoine Carême, L’art de la cuisine française au XIXe siècle. Traité élémentaire et pratique(1832). Éditions Payot & Rivages, Parijs, 1994, pp. 50, 71, 73. Marie-Antoine Carême, Le Maître d’Hotel, ou Parallèle de la cuisine anciènne et moderne considérée par le rapport de l’ordonnance des menus selon les quatre saisons (1822, 1842). This nourishing soup with poultry quenelles is a recipe from Antonin Carême. A soup such as this was served during large festive balls to sustain the guests.